August lingered in my life a lot longer than most months. It gave me plenty of time to discover some new favorites and seriously check things off my to do list, so I'm not complaining. I've been having one serious love affair with IT Cosmetics lately. After a huge PR package arrived (watch the vlog) the brand took over my collection as I've been giving everything a serious test. I recently shared my favorites from all the new launches, but two have stuck out more than the rest. The Bye Bye Lines Foundation is the best I've tried in a long time. More often than not I gravitate towards tinted moisturizers and BB/CC creams since foundations just don't give that light glow. This foundation finally ticks all the boxes. It's super hydrating and dewy on the skin while being about to be worn light our built up. Just gorgeous. The Brow Power Powder became a fast favorite as well because of just how easy it is to sweep onto the brows every day. Plus it's the perfect shade for my somewhere between light brown and dark brown hair. My mascara drawer is packed full of currently-in-use mascaras these days, but they've all been letting me down. Nothing seems to do what it boasts it does except Urban Decay's Perversion Mascara. I'm sure I'm moments away from scraping the last bits out of the tube, but it's just so good at giving length while bringing some serious volume. Plus it holds a curl throughout the majority of the day despite my lashes demanding to return to their stick-straight ways. After what felt like years in fashion hibernation, I'm getting the itch to expand my wardrobe again. I've added a few statement pieces here and there over the past month, but nothing quite like this poppy floral shirt from H&M. I wear it throughout my favorites video if you want to see it on, but it's so unlike anything I've worn in the past. And I love it. Poofy sleeves and a nice fit. Sold. August packed itself full of work accomplishments, but designing and producing our first wholesale catalog tops the list. I still can't believe it exists in the real world now. Next on the to do list is to start hitting up retail spaces trying to get our products in them. No small feat but we're feeling pretty optimistic. 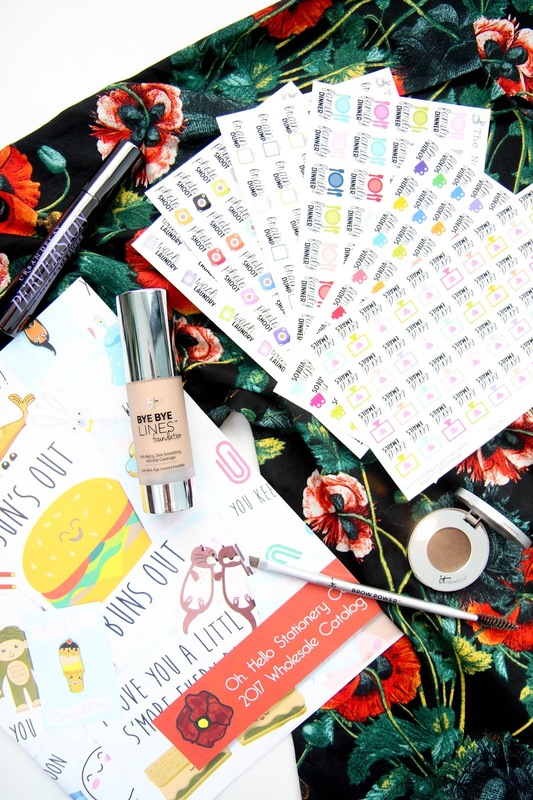 No favorites are complete without some planner stickers I've been crushing on lately. My bestie Meghan over at The Novel Coffee just released a seriously impressive line of font stickers. There's something like 26-28 different ones to choose from and I basically need them all in my life. Head on over there to check them out and use code "KAYLA" for 15% off if you find anything you just have to have. What a crazy month that only jumpstarts the even crazier fall months. So much is on the horizon and I can't wait to share all the adventures with you. What have you been loving in August? Three Years of Oh, Hello Stationery Co.